When you weave an elegant scarf through it, this versatile cowl becomes a fashionable neckpiece that can be worn in different ways. 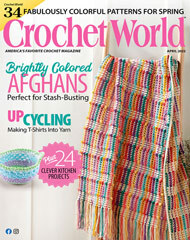 This e-pattern was originally published in the October 2013 issue of Crochet World magazine. Size: 7 1/2"W x 40" in circumference. Made with bulky (chunky) weight yarn and size I/9/5.5mm hook.